Can you really improve your odds at slots by following a winning strategy? Many don't think so saying it's all down to luck. However, lots of us stick to techniques like varying bet amounts and switching games that have won for us in the past. 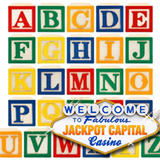 One Jackpot Capital Casino player got lucky last week simply by playing the games in alphabetical order. The other night, Thelma did well on two "B" games, Bank on It and Bonker, before moving on to the new Double Ya Luck. However, it was the very irst game on the list, 7s and Stripes, where she really won big. She quit for the night with a balance of $11, 373K. A regular slots player at Jackpot Capital Casino stuck to her usual slots strategy and won over $11,000 in one night. You may not walk away with $11K like Thelma did, but you can still cash in on some nice casino bonuses during the final week of Jackpot Capital’s $100,000 Mexican Fiesta. Qualify for bonus prizes, generous match bonuses and free spins just by playing in the online casino or in the new mobile casino that now has nearly 30 mobile slots and mobile blackjack.